What I especially love about Adam’s blog is that he makes it abundantly clear that many of the things a gay hipster might do when traveling are a lot like the things a distinctly non‐hip gay man might do. And, by and large, they are the same things that a non‐gay, non‐hip, non‐male traveler might do. When I first started to write this blog post, I was sure I knew the answer to that question. But now I’m doubting myself. It’s true that I don’t typically go looking for gay clubs and hipster nightspots, but I have ended up dining in some of Adam’s recommended hipster restaurants, and I have certainly visited many of his recommended sights. In Copenhagen and Oslo I chose to book lodging through Airbnb in the homes of gay couples. This didn’t serve as an entree into the underside of gay life in these cities. In fact, it didn’t feel particularly different from sleeping anywhere else, except I had the opportunity to engage in conversation with them. We didn’t talk about “gay” things particularly. I didn’t get tips on where to go to meet gay people. I didn’t ask, “What’s it like to be gay in Copenhagen?” or “When did you come out in Oslo?” We talked about work and travel and culture and politics. Elsewhere, I have stayed in B&Bs or hotels or guesthouses where the owners were not gay. And I’ve had conversations about work and travel and culture and policics with them as well. Occasionally I do find gay clubs or meeting places in some of the places I visit. I also look for sights that have some importance in gay history or culture. I also occasionally find bridge clubs or classical music concerts or nature hikes — just as Adam finds cooking classes, swimming pools, or live music venues — because these are some of my other interests. And I go to see the sights wherever I am: museums, castles, old churches and cathedrals, farmers’ markets, cafes, restaurants, and shops, the same ones that are listed in Adam’s Hipster Guides, because they’re also listed in my Rick Steves or Lonely Planet or Fodor’s guidebooks. 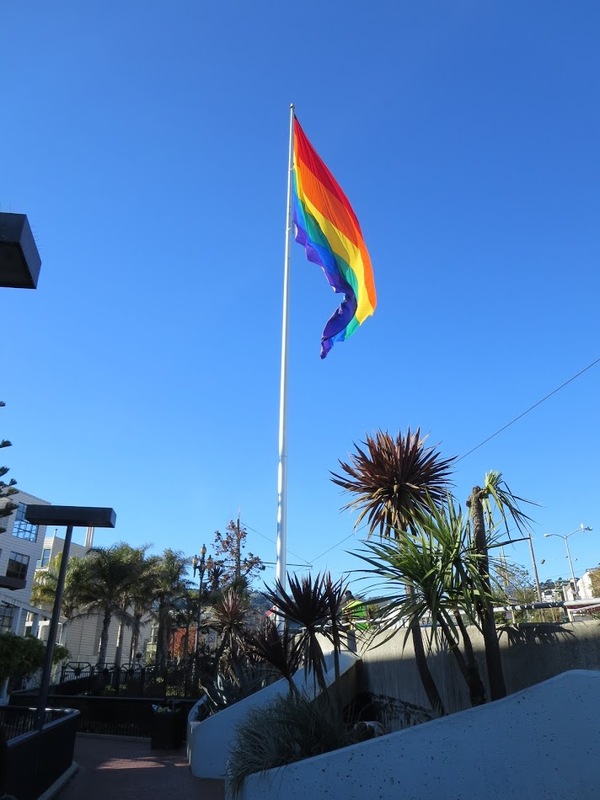 When I was in San Francisco in December 2016, I spent a good amount of time visiting the Castro, the neighborhood that is the center of the city’s gay community. There I took great pride from the plaques that are part of the Rainbow Honor Walk, including this one of Alan Turing. In San Francisco’s City Hall, I was moved by this bust of Harvey Milk, the only piece honoring someone other than a mayor of the city. I didn’t visit City Hall looking for gay history, but I took special note of it. Amsterdam’s Homomonument. This triangle is one vertex of a larger triangle. It points towards the Anne Frank House, which is nearby. The engraving is a line of poetry by the Dutch Jewish gay poet Jacob Israël de Haan (1881–1924): Naar Vriendschap Zulk een Mateloos Verlangen (“Such an endless desire for friendship”). The text is from his poem To a Young Fisherman. I came across this bench in Hoorn, on a day trip from Amsterdam. The plaque has the following quote (in Dutch) from the Dalai Lama: “Love, compassion, and tolerance are not luxuries but necessities.” Under that it says “National Coming Out Day 2015.” I didn’t go to Hoorn looking for this bench. I didn’t even know it existed. As a traveler who is gay, I was touched to find it here. Something else that occurs to me: I also travel while Jewish. I am not a Jewish traveler, but I do find and take special interest in places and things that tie into Jewish culture and Jewish history. In Venice I took a tour of the Jewish ghetto. In Amsterdam I went to the Jewish Historical Museum. I don’t go out of my way to seek these things out. If i were a Jewish traveler, I would seek out destinations on that basis. I would make that the focus of my travels and of my blog. Gay travel is focusing on gay activities while traveling, whatever they might be, but also doing things that all travelers do. If you are interested in gay travel, you might schedule your travels to coincide with Pride celebrations. You probably seek out gay neighborhoods and try to connect with gay locals and other gay travelers. And when you do regular traveler things, you maybe bring a gay perspective to the experience. In an art museum, you might seek out works by gay artists and emphasize them when you blog about them. Or you might read up on famous gay residents of a city and look for sites related to them. Traveling while gay is focusing on the things that all travelers do, but also doing your favorite gay activities. And you might have the exact same experiences as the gay traveler. I don’t think of myself as a gay traveler. But wherever I go, I’m traveling while gay. Gerome, I’m delighted to be a member of the same club with you guys! Looks like you have a new blog in the works. Looking forward to seeing it soon!